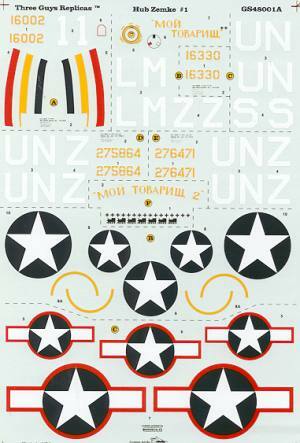 This is TGR's first Aces sheet and covers all of the aircraft flown by Hub Zemke once he started his association with the P-47 Thunderbolt. For the sake of not overloading the page with profiles, a few of them are not shown. 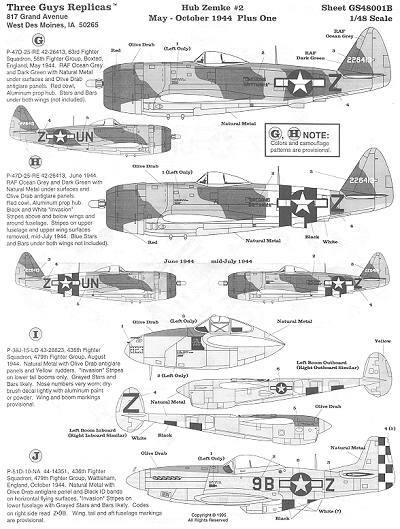 Hub Zemke was serving in Russia training their pilots how to fly the P-40 when the US entered the war. He was recalled and was given command of the now famous 56th FG in July of 1942, which was starting up on the P-47B Thunderbolt. They then moved to the UK in January 1943 and were given brand new P-47Cs. He left the 56th in November but returned in January of 1944 to begin flying P-47Ds. By May, these D models had become the bubbletop variety and his planes had started receiving the upper surface disruptive camouflage. He moved to the 479th FG and their P-38s in the late summer of 1944. When this unit transitioned to the P-51D in October of 1944, he also flew those aircraft. 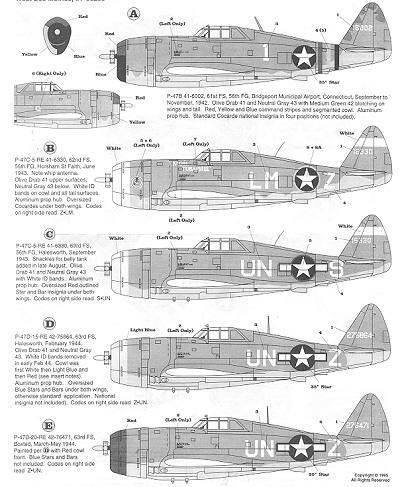 The sheet also includes a couple of most unusual P-47s. First is a fictitious one that was the subject of a painting. The other is a very late P-47M that was used as a Victory Display in Paris. Zemke never flew this particular aircraft. 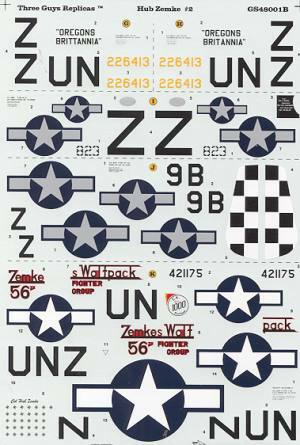 As with other TGR decal sheets, the instructions are superb and offer not only full painting and decal placement info, but also some historical background on each aircraft.